NOVEMBER IS "CARING" MONTH FOR EAS PROGRAM. 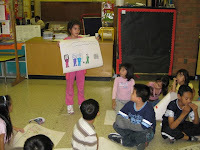 Students from Bancroft site started a series of creative learning about positive character. They prepared a short skit where they assigned director, actors and actresses among themselves. They are also the ones who plan and write the script for their short film. Friday is when they will show it to the whole group and will have short discussions what they learned from the activities. They also do crafts which will help them remember the positive character that they are studying…and of course they discuss how they can apply the character that they learned. 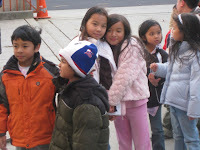 EAS students CARES about the Children’s health. Our students participated in the national art contest to promote children's health care organized by National Korean American Service Education Consortium Association. The theme of the contest is "America's Future starts with Healthy Children." 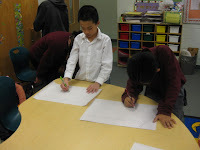 EAS students CARES about their community. 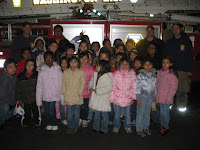 On November 26, our Bancroft students went to the DC Fire Department station in 14th Street for a educational tour with our DC Fire Fighters. The students learned basic fire safety skills and had a short briefing of what is the typical daily life of a firefighter. Maryland After School Programs Holiday Party.